A LOCAL derby is no ordinary football match. Rivalries are deeper, passions are higher, and tackles are harder. It takes a strong referee capable of taking charge – without taking centre stage – to handle such an occasion. It also needs players to maintain their discipline and professionalism in the game’s more heated moments. Saturday’s Fife derby had neither and, as a result, what should have been a thrilling game descended into nothing more than a farce. It would be easy for Raith to blame their defeat entirely on the performance of referee Crawford Allan. His decisions certainly contributed to the result as reds cards for Raith pair Allan Walker and Dougie Hill left the home side to play the entire second half with just nine men. Both sending offs were controversial; Walker’s lunge at Ryan Wallace was reckless, but not malicious, while Hill was only one of several players involved in a heated exchange in the tunnel as the teams left the pitch at half-time. Raith will also point to the ref’s first half inconsistency as the catalyst for their ill-discipline as he cautioned three of their players for fairly minor offences, then turned a blind eye to Josh Falkingham’s scything challenge on David Smith. The sense of injustice from the imbalanced card count certainly seemed to incense the Raith camp, both on the pitch and in the dug-out, and in the aftermath of letting a one-goal lead slip, frustrations boiled over. The match started so promisingly. Both teams looked up for it, and there was half-chances at both ends before Pat Clarke opened the scoring in front of the home fans in the 24th minute. 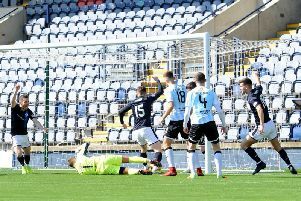 He rose superbly to send a thumping downward header towards goal, and although Pars ‘keeper Paul Gallacher got a hand to it, he could not keep it out. Raith’s self-destruction started 12 minutes later when Hill’s slack touch 25 yards from goal let Wallace win possession, and the defender’s attempts to retrieve the situation resulted in him conceding a foul, and picking up his first booking. Stephen Husband stepped up and drilled the resultant free-kick low past Ross Laidlaw and the derby was all-square. Aggrieved at both the soft nature of the equaliser, and the performance of the referee, Raith were needing half-time to regain their composure. It didn’t come soon enough for Allan Walker. When a shove on Clarke went unpunished the Raith captain sought revenge in the next tackle as he clashed with Wallace. On first viewing it seemed to be a wild swipe borne out of frustration but with no intent to seriously injure and no contact made. It was certainly no worse than the infamous Falkingham tackle inside the first minute of the last derby at East End Park, which resulted in only a booking. The reaction of the Pars players in angrily surrounding Walker seemed to jolt referee Allan into action. He suddenly rushed to the scene before losing his footing and slipping into the pack of players, wrapping his arms around one to stay on his feet, like something out of a Monty Python sketch. It was hardly the aura of a referee in control of himself, let alone the situation, but after having words with the Main Stand side assistant, Walker was shown a red card, and what had been a competitive derby had now turned poisonous. The half-time whistle sparked scenes of mayhem on the trackside as first Paul Smith, the Raith assistant, and Dunfermline captain Jordan McMillan angrily exchanged words. Several players from both sides got involved, with pushing and shoving in evidence, and the outcome was a second yellow card for Hill, and also a booking for Dunfermline’s Ryan Thomson. Amid the melee it was difficult to see who was guilty of what, but subsequent photographs have shown Hill grabbing Falkingham’s throat – sheer madness when you’re already on a booking and your team is down to 10. The insinuation after the match was that the police had instructed the referee to take action against the players, which opens a whole other can of worms, although the local constabulary has since denied this. With two men off for an early bath, Raith were left with only one game-plan for the second half - survival. That went out the window after just two minutes as Pars winger Joe Cardle had time and space to cut in from the left wing and curl a beauty of a strike past Laidlaw. To their credit, Rovers produced a fantastic effort to keep the score down, the nine men refusing to be humiliated, and even came close to equalising late in the game. David Smith whipped a couple of dangerous free-kicks into a Pars box, but Brian Graham’s headed efforts were saved by Gallacher. A slip by Laurie Ellis allowed Dunfermline to break away two minutes from time and Husband scored his second and his team’s third. But given the nature of the match, there has surely never been a more hollow Fife derby win than this. Raith: Laidlaw, Thomson, Ellis, Hill, Malone, G.Anderson (Graham 73), Mensing, Walker, Smith, Spence (S.Anderson 46), Clarke. Subs Not Used: Roberts, Hamill, Donaldson. Dunfermline: Gallacher, Geggan, Dowie, Morris, McMillan, Cardle, Thomson (Dargo 50), Husband, Falkingham, Barrowman (Whittle 78), Wallace (Kirk 62). Subs Not Used: Hrivnak, Potter.